Posted on 12, August 2016 by EuropaWire PR Editors | This entry was posted in Construction, Real Estate, United Kingdom and tagged apartment, Castlefield, Ellesmere Street, Gary Hughes, Glenbrook, GRAHAM Construction, Manchester. Bookmark the permalink. Work underway on Manchester residential scheme. 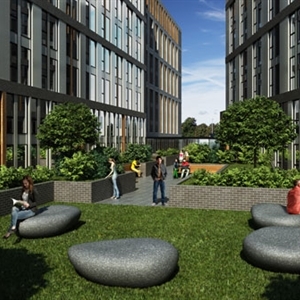 MANCHESTER, 12-Aug-2016 — /EuropaWire/ — GRAHAM Construction has secured a contract to deliver a £40m, 230-apartment PRS (private rented sector) scheme in Castlefield, Manchester. GRAHAM was appointed to the scheme by property development and investment company Glenbrook, which has identified Castlefield as a key area for high-quality residential growth. The development – backed by investment partner Moorfield – will consist of three buildings situated between Ellesmere Street and Chester Road to the south of the city centre, offering 1, 2, and 3-bed rented apartments. GRAHAM Construction has spent recent months working alongside the Glenbrook team and AEW Architects to develop detailed design and optimum construction methodologies for the project. Work has now started on the 1.25-acre site, with the project expected to complete in summer 2018. Gary Hughes, regional director for GRAHAM North of England office, said: “Glenbrook and AEW Architects have created an ambitious scheme that will meet the demand for high-spec, aspirational living spaces with a strong sense of community. “Residential is a key sector for GRAHAM Construction and we have a wealth of experience with large scale apartment, student accommodation and hotel projects across the UK. The Ellesmere Street buildings will range from eight to twelve stories, and residents will benefit from a range of facilities including concierge, a gym, storage areas and basement car parking.